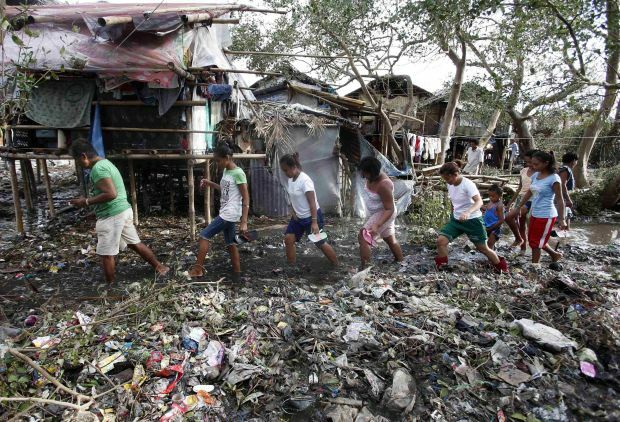 MANILA, Philippines (CNS) — An emergency adviser for Catholic Relief Services said many Filipinos learned from Typhoon Haiyan and willingly went to shelters before Typhoon Rammasun struck. CRS teams were fanning out to affected areas in mid-July after Typhoon Rammasun propelled its way across the northern half of the Philippines, leaving at least 40 people dead and destroying more than 26,000 houses. Tromans said the agency was assessing the Bicol region, about 250 miles southeast of Manila, where Rammasun first made landfall. She said CRS’ local partners had reported people had been moved into evacuation centers. “And then for Quezon (province), we’re struggling to get more information. We haven’t been able to get in touch with people there. We’re thinking some of the cellphone (towers) are down,” she told Catholic News Service July 17. Rammasun was the most powerful storm to slam the Philippines after Typhoon Haiyan cut a path of destruction across the central part of the country last November, killing 6,300 people. Rammasun affected more than a million people with winds that peaked at 115 miles per hour, knocking out power in 13 provinces and three cities. Broken trees littered streets and crumpled cars beneath them in the Manila capital region. Four of the capital region’s 16 cities and several provinces experienced floods. Several calls to Caritas Philippines officials were not answered. Tromans said CRS made storm preparations a day before Rammasun was expected to touch land. She said it “seemed like it was much easier” for her colleagues to move people out to evacuation centers this time around, compared to how “difficult” it was before Haiyan struck. Parts of Samar province, just south of Bicol, were also affected by Rammasun. Haiyan’s first target was Eastern Samar, and Tromans said CRS was especially paying attention to the rebuilding efforts in the Haiyan-devastated areas. “We’re really trying to prioritize those most at risk ahead of the storm season,” she said.